GDPR goes into effect on May 25, 2018. As of this writing, companies only have 44 days left to bring their marketing, data retention, data storage, and emergency response plans into compliance. At, Chow-Bryant, we’ve been working tirelessly to make sure all of our services are in compliance with GDPR. Throughout the process we’ve been looking for a reliable analytics provider that takes GDPR seriously. To be fair, every major analytics provider has promised solutions, but so far none have emerged. That all changed, today. Google just announced a new feature for controlling how long user and event data is stored in a property. We’re hopeful this is just the first new feature Google will introduce to help marketers control how customer data is stored and for how long. This isn’t a catchall solution for GDPR compliance, but it’s an important component. With all that said, there’s still a long way to go to bring every marketing service and platform into compliance. If you haven’t already read the GDPR articles you need to start yesterday. This isn’t legal advice (you should already have a lawyer for that), but as marketers we will be subject to more scrutiny and regulation in the near future. From Mark Zuckerberg’s testimony before the U.S. Senate to Ad Blockers to GDPR, the writing is on the wall. The people are out for blood, and if this was the French Revolution, digital marketing would definitely be royalty. We must consider tracking and privacy from the user’s perspective and give them meaningful way to control how our tools act. The regulations aren’t even in effect and they’ve already inspired an entire niche industry of GDPR consultants (caveat emptor). This is easier said than done, but that’s for another article. To find the data retention controls simply navigate to Admin –> Property –> Tracking Info –> Data Retention. Currently, Google offers two options in the Data Retention Controls. These settings won’t go into effect until May 25, 2018, but there’s no reason to delay. Let’s discuss these new settings in more detail. Use this setting to select how long user data is stored. Right now you can only set this to 14, 26, 38, ,or 50 months. Alternatively, you can choose to retain user and event data indefinitely. If you don’t know which option to pick, it’s probably best to stick with the default setting of 26 months. Additionally, you should try to shortest setting that is appropriate for your brand. If your site relies on personalization you may retain data longer than a one-page site for a local business. Another thing to keep in mind is event tracking. If you’re tracking events that take place over multiple sessions, make sure your data retention window is long enough or the reset on new activity setting is on (more on this below). If your retention window is too short your analytics may not record critical events that took place over multiple sessions. As a result, you might inadvertently negatively skew your goal and events reports. Your campaigns might be knocking it out of the park, but your reports will say otherwise. This setting is a little more confusing. This option let’s you decide whether or not a user’s retention period resets on repeat visits. 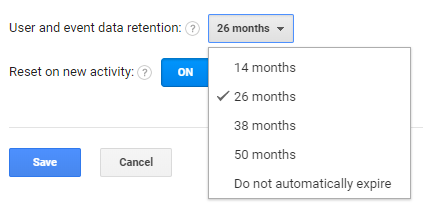 If this setting is on, and your retention window is 26 months, then every time a user returns to your site Google Analytics will keep storing their information until 26 months pass without a return visit. This setting is subtle, but it’s important to understand how it works. As mentioned above, if you’re tracking multi-session events you will most likely need to leave this setting on. Therefore, you may have to build your GDPR compliance solution with these limitations in mind. We expect this guide to keep growing as Google rolls out new analytics features. Follow us on social media or check back for updates to this guide. Alternatively, if you need a consultant to help you setup custom event tracking or review your Google Analytics implementation, contact us for a free consultation.